I’ve made these Philidelphia stuffed chicken fillets a few times using a recipe from my sister, really tasty and filling. Pre-heat the oven to 200 ⁰C, gas mark 6. Cut a pocket length ways into the chicken breast and fill with the Philadelphia. 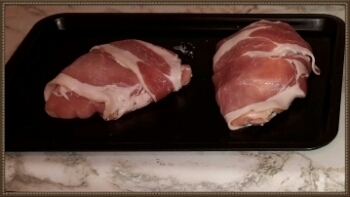 Wrap with parma ham slices until completely covered, should be 3 or 4 slices. Roast in the over for approximately 30 minutes until the parma ham is golden and the chicken cooked through. Serve with sweet potato chips or fresh seasonal vegetables and new potatoes.